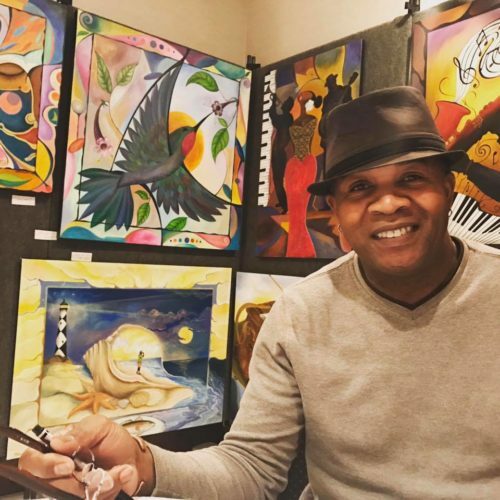 Local artists and artisans join nationally-known artists in The Art Gallery Walk, with tents displaying original works on canvas, handcrafted jewelry, mixed media, leather work, dolls, photography, sculptures, and ceramics. As you stroll along the street you will be inspired by the artistry exhibited, and you will marvel at the variety of outstanding work on display. We encourage you to meet the artists, learn about their techniques, and purchase an original creation to enjoy for years to come. The gallery at right shows some of our 2018 Art Gallery Walk artists and their work. Click on the links in the list below to see more on the artists’ websites. The application period is now open! If you are an artist interested in applying for the 2019 Art Gallery Walk, to exhibit and sell your work to our 10th anniversary audience, click the link below for the online application.